The Wai-O-Tapu Crater of New Zealand is a must visit when traveling around the North Island. When they told us we were going to the Wai-O-Tapu Thermal Wonderland I was a little skeptical. It sounds like a kids science park. Not really the first thing that comes to mind when you think of the North Island of New Zealand. I was taken by surprise when I entered and saw no Ferris wheel, roller coaster or Cotton candy stand. Instead I was welcomed with the smell of sulpher and the view of this boiling caldera they call the Champagne Pool. Now that is cool! For a photographer I felt like a kid in a candy store. The name Champagne Pool comes from the mass amounts of carbon dioxides it spews, similar to a glass of bubbling champagne. This geothermal area is filled with thermal springs and geysers and we spent hours walking around taking in the wonders of mother nature. Sitting by the edge of the Champagne Pool, I waited patiently for the steam to clear just enough that I could get a good view of the background. The colours, the steam and the contrasting sky helped bring the image all together. So as you look at this image and take in the beauty, just light a match, smell the sulfer and pretend you are sitting at the edge of a boiling caldera. It is a great way to end the weekend! 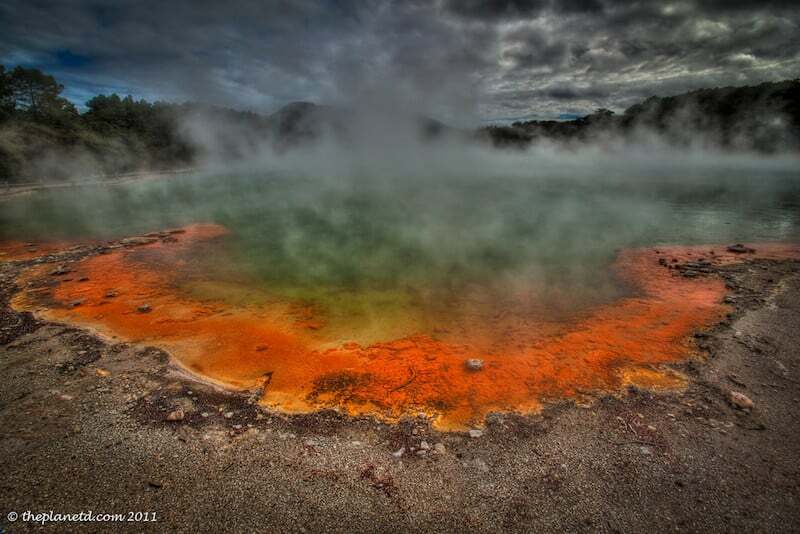 10 Responses to "The Boiling Crater of Wai-O-Tapu"
Thanks Todd, We haven’t been to Yellowstone yet but are looking forward to it. This place was definitely impressive. There were many boiling craters. THis is an incredible shot!!! Need to get more involved in geothermal and volcanic adventures (even though I am allergic to sulfa). Now that’s an allergy I have never heard of. Hope it doesn’t affect your future volcanic adventures! Thanks for stopping by. After looking this pic i jst want say…OMG……!!! Nice shot man, can you swim there or is that not recommended at all? What a wonderful shot! I’m speechless in front of such beauty. Thank you for sharing this wonder of nature. Stunning photo. When I was there, I couldn’t get the mist to clear enough to get a decent photo (and I was missing my DSLR also), so envious of your shot!